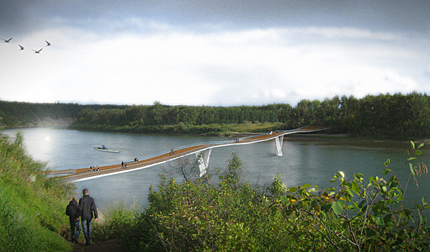 In July 2013, City Council approved the construction of a 262 metre footbridge to link Terwillegar Park to River Valley Oleskiw. The initiative realizes the direction outlined in the Terwillegar Park Concept Plan to link the park to the north side of the river. The construction of the Terwillegar Park Footbridge was completed in fall 2016 and the bridge opened to the public on October 21, 2016. In fall 2013, the City began conversations about the Terwillegar Park Footbridge and West End Trails with park users, user groups, area community league representatives, and members of the public. A Community Advisory Committee has been established that includes representatives from area community leagues and park user groups. The City of Edmonton has conducted environmental reviews on the Terwillegar Park Footbridge to reduce the environmental impact of this project.